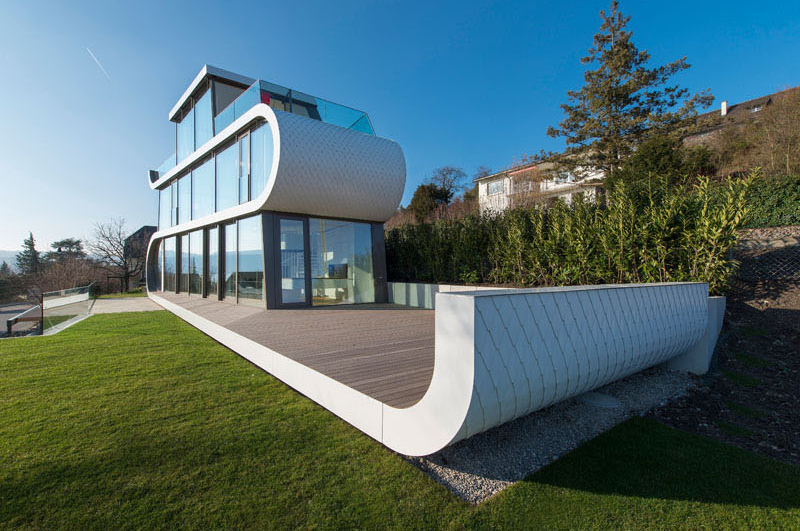 Have you seen a house that has a ribbon-like feature on it? 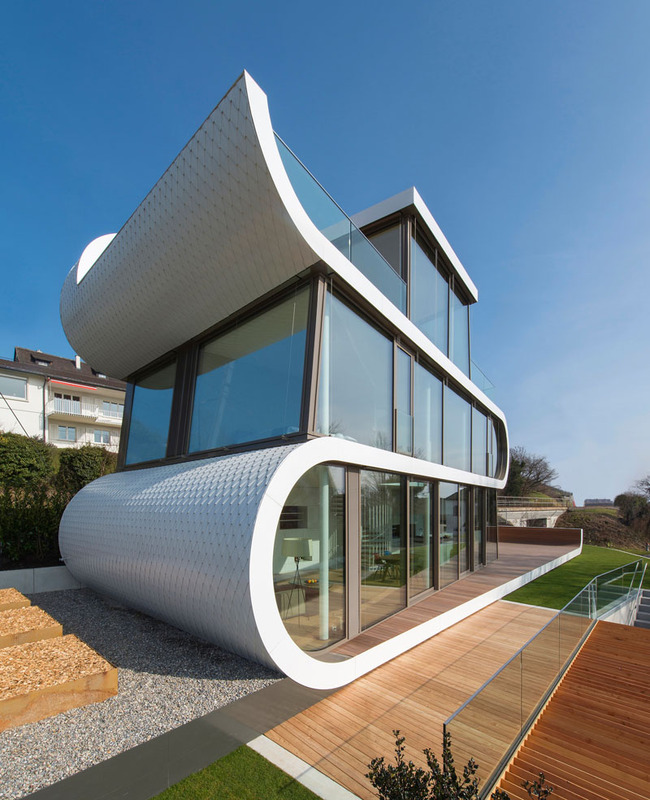 It always impresses us once we see homes that are creatively designed with a unique facade or interiors. It makes us think that we can actually come up with a house design that is totally different from other home designs and would set our homes apart from the rest. For sure, you have seen unique residential facades already which might even make us wonder on how they made such homes because of how different it is. But apparently, designers and builders could come up with such designs not just because they are creative but because they have construction techniques that will have help them achieve a complicated design. Today, we are going to show you a house that has a very unique exterior. 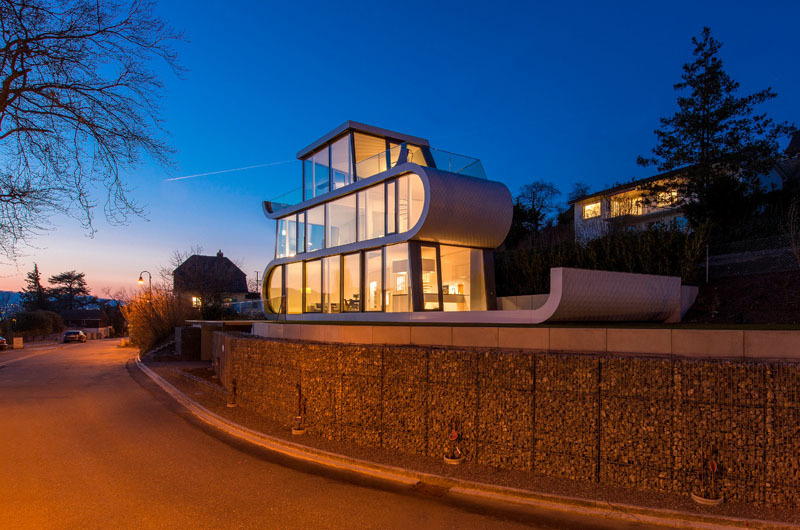 This residential building is called the Flex House located in Switzerland. Its design seemingly has a white ribbon that winds all throughout the different levels. Evolution Design worked on this unique architecture which resembles a futuristic vessel that has sailed in from the lake and found itself a natural place to dock. 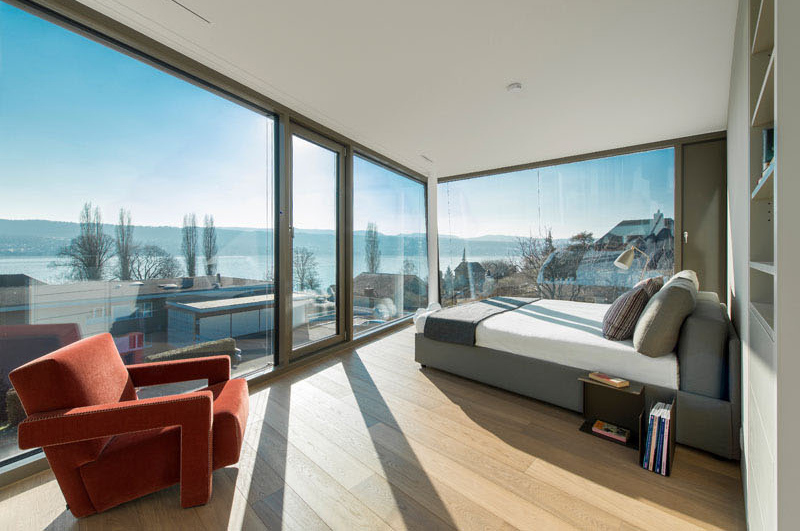 This house is overlooking Lake Zurich in Switzerland and its has a ribbon-like surface folding its way through the home which define its floors make it very distinct from the rest of the homes in the neighborhood. The interior is also very impressive with a cozy and relaxing design as it combined wood and white colors in it. Come take a look at the house through the images below. Unique feature: A house has a distinct ribbon-like surface that defines the different levels and makes it appear totally unique. Apart from the three levels, it also has a lower level intended for the garage. We cannot say that the house is mere beauty because it is designed with function in mind. The house is comprised of three levels with an upper deck and a lower deck that is still part of the ribbon-like feature. 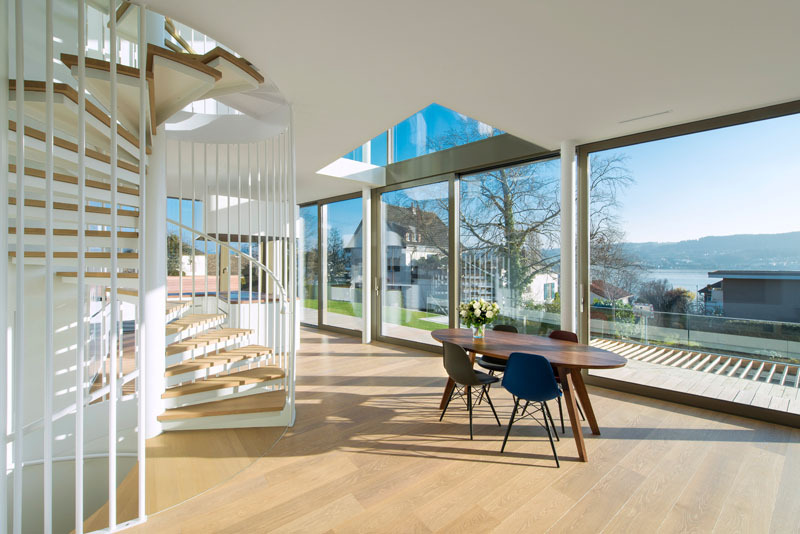 The main deck of the house can be accessed from the living areas on the main floor of the home. The design of the house is indeed very unique and it is made even more beautiful because of the flooring with wood, grass and gravel on it. Such a beauty, right? The white ribbon of the house also continues past the home to allow for outdoor space and it has wooden decking on it as well as a white exterior texture that adds more appeal to it. To access the house, one needs to go up through a few steps where a green lawn would greet guests into the area. During the night, the home lights up like a lantern and is like a sculptural feature in the area. Notice that the home is elevated from the street which seems to bring it up like a pedestal, giving more emphasis to its beauty. 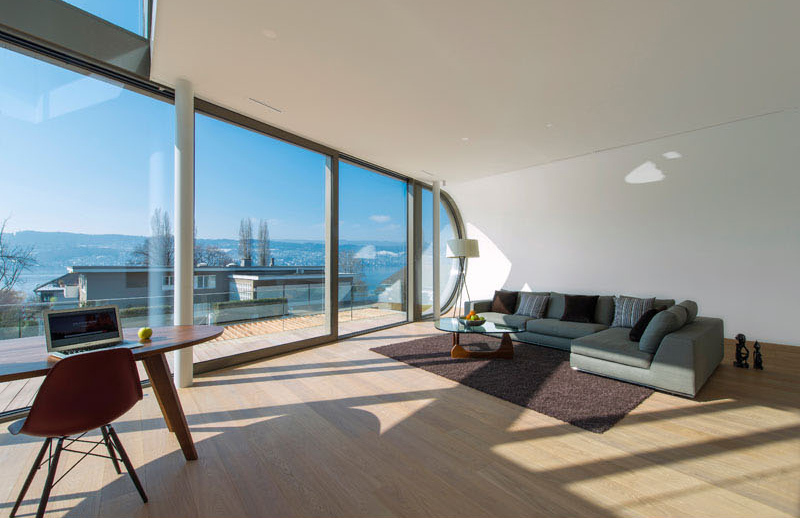 Upon entering the home, one will be greeted by floor-to-ceiling windows that perfectly frame views of the lake. While inside, you would feel like you are still outdoors because of all the glass walls in it. At one end of the main floor is the kitchen that’s filled with rounded corners- just like the exterior design of the house. It does look very futuristic but of course, it is functional and beautiful with a bulky range hood that also adds appeal to the space. At the opposite end of the main floor is the living area with a soft gray couch and a purple area rug. 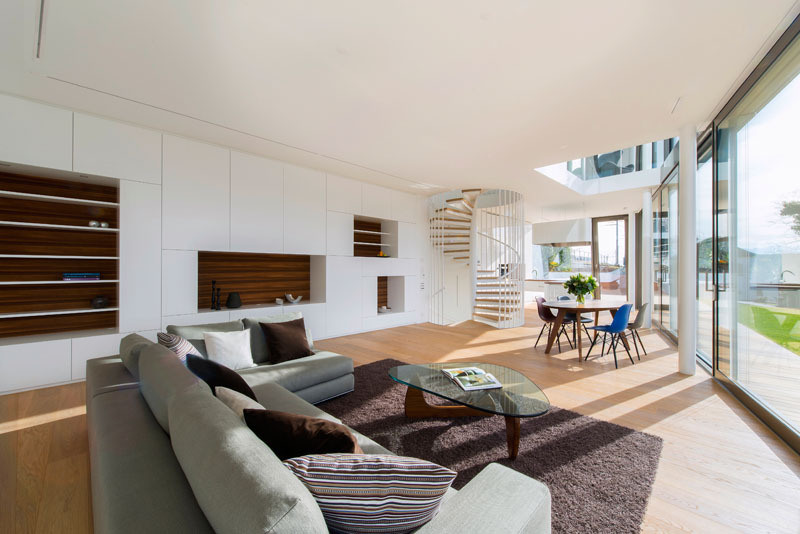 In the middle of the living area is a triangular shaped coffee table. You can also see a wall system that provides plenty of storage to the home. The curves that are seen in the exterior of the house are also a lovely feature inside the home as it provides a unique walling to the interior. In the living area, there is also a working space wherein one can work while looking at the outdoor beauty. Isn’t this beautiful? 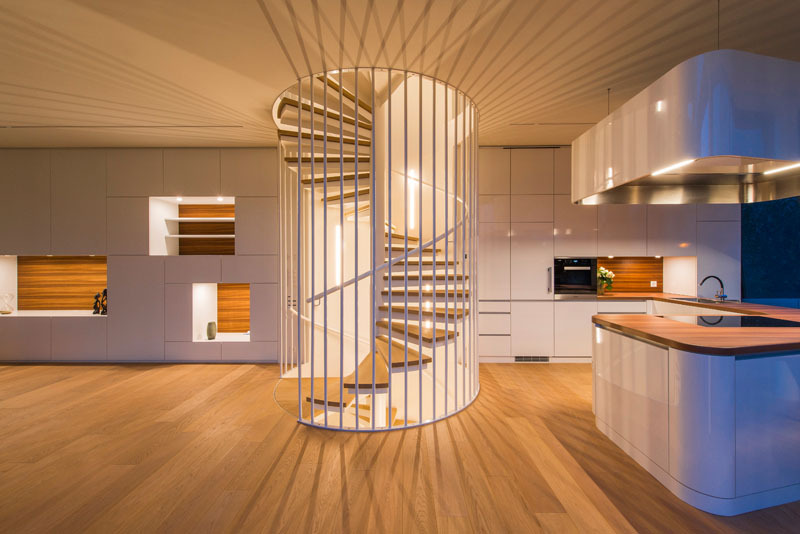 Seen here is an illuminated spiral staircase that takes you to the upper floors of the home. Its railings are tall vertical steel painted in white while its treads are made from wooden steps. 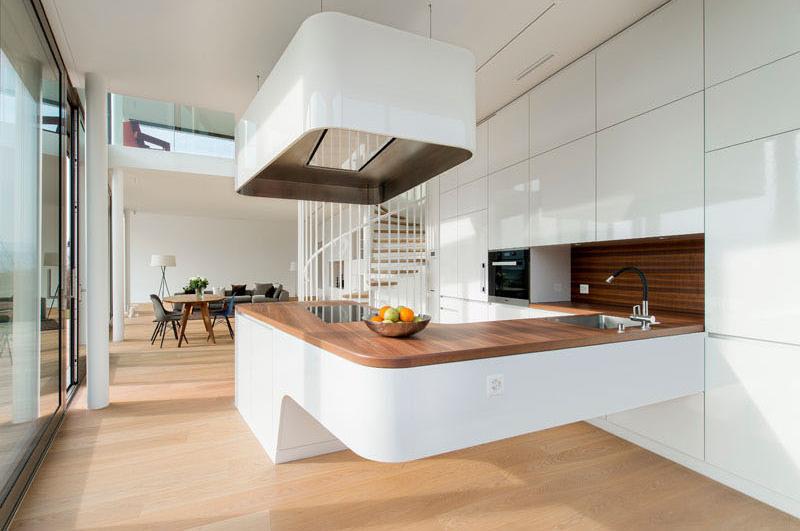 Near the staircase is the kitchen area in white and wooden palette. On the first floor of the home are the guest bedroom and a master bedroom, that are both accessed from the landing. The landing has a void that allows you to look down into the living area. Even in this part of the house, you can still see the use of glass. This is the master bedroom which is located opposite the guest bedroom where one could wake up to views of the lake. Although the colors and furniture here are minimal, it has a pop of color from that soft velvet red chair. 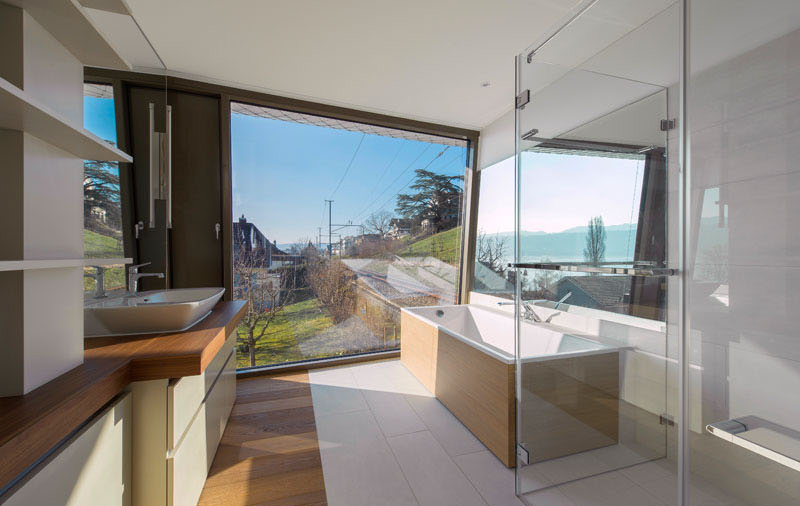 In the master bathroom, it features a glass-enclosed shower, a bathtub with a wooden surround as well as a large picture window to allow plenty of natural light to fill the space. This area has the combination of wood and white colors as well as glass too. 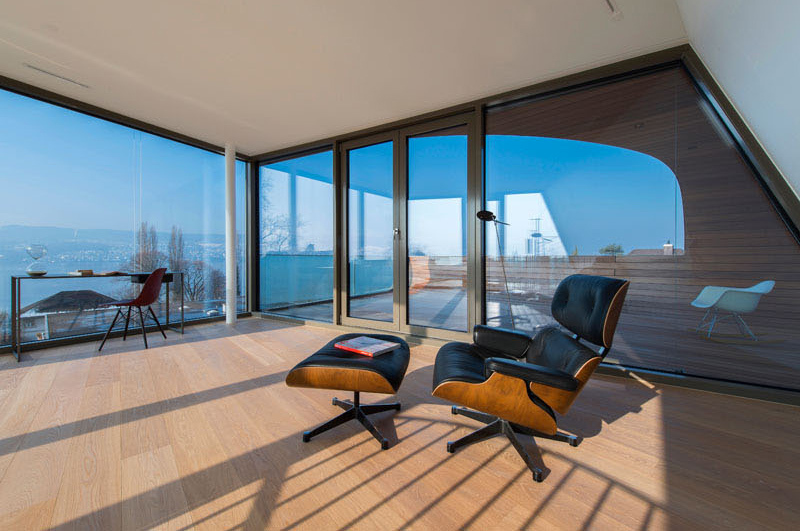 The top floor of the home has a studio space that provides a 180 degree view of the lake. 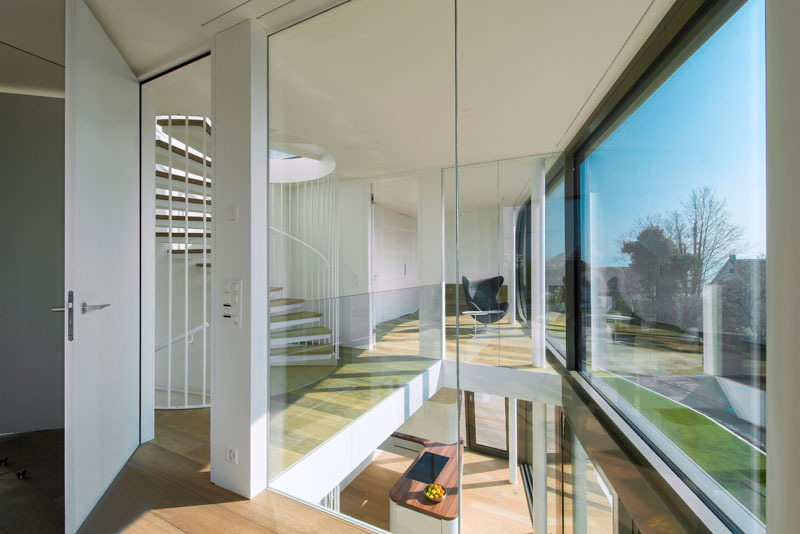 Like the other areas, this one also has minimal furniture in it while glass surrounds the space which brings natural light to the area and provide views from it. 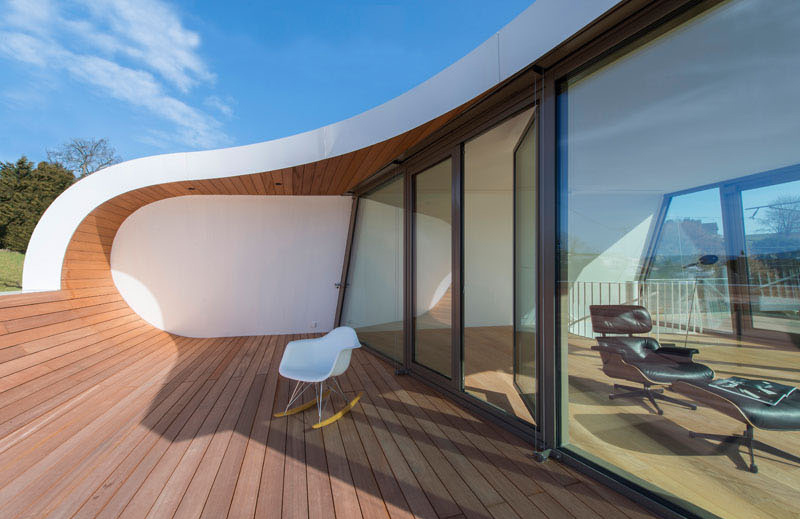 Just off the studio, there’s a curved deck where one can rest and relax or have a quite time alone while looking at the lovely views around the area. It has a wooden finish that goes all through out from the flooring to the ceiling. Evolution Design definitely did an amazing job with this house design. Aside from its ribbon-like feature, I like it that the house extends to at the lowest floor for the deck. The designers really had creative minds when they made this while making sure that it is structurally sturdy and stable. The interior of the house is very beautiful too. How about you, what can you say about this house?